A51819 / 86120-AC150 / CQ-ES4460X Six CD changer, Err message in display, will not play CD's, will not eject or accept CD's, gears grind, $295. Before repair, disconnect one of the car battery terminals for several minutes. This acts as a reset and may bring the changer back to working conditions. Otherwise, CD changer repair issue. Six CD changer, Err message in display, will not play CD's, will not eject or accept CD's. Before repair, disconnect one of the car battery terminals for several minutes. This acts as a reset and may bring the changer back to working conditions. Otherwise, repair rate $295. Single CD player does not operate properly, error or skips when CD plays, $185. Matsushita / Panasonic Six CD changer, Err message in display, will not play CD's, will not eject or accept CD's. Before repair, disconnect one of the car battery terminals for several minutes. This acts as a reset and may bring the changer back to working conditions. Otherwise, repair rate $295. CD inop with error code, single CD player. CD inop or jammed, 6 disc in dash changer. 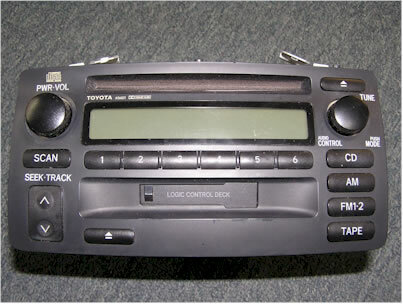 We presently do not repair Fujitsu Ten Car Stereo. We are attempting to locate a parts distributor for these stereos so they can be repaired economically. W/Separate Harmon Amplifier No audio output or intermittent, no or intermittent tape, display back lights intermittent, tape clicks one direction or both. Defective stereo $125. 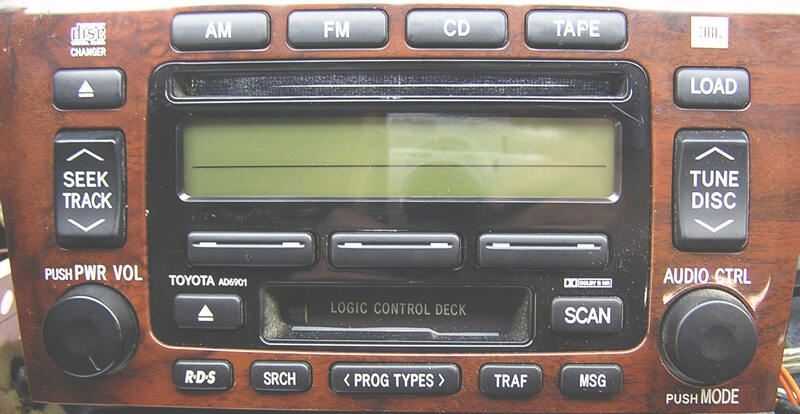 74834 / 08601-00891 / CX-CS0810F Six CD changer, Err message in display, will not play CD's, will not eject or accept CD's. Before repair, disconnect one of the car battery terminals for several minutes. This acts as a reset and may bring the changer back to working conditions. Otherwise, repair rate $295. 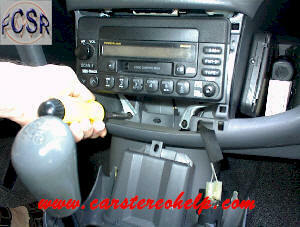 We Do Not Repair Fujitsu Ten Car Stereo. We are attempting to locate a parts distributor for these stereos so they can be repaired economically. 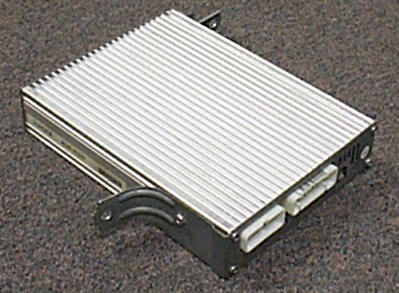 100366 / 86140-06390 /138000-5400B101 Display cracked or broken, $250. 86120-06460 / DW468100-0336 DVD or Navigation Drive does not accept Map DVD or eject, $350. Six CD Changer does not eject, play or eject CD's, $450. Display cracked or broken, $450. Six CD changer, Err message in display, will not play CD's, will not eject or accept CD's. Before repair, disconnect one of the car battery terminals for several minutes. This acts as a reset and may bring the changer back to working conditions. Otherwise, repair rate $345. CQ-JS8360X / 86120-AA140 Six CD changer, Err message in display, will not play CD's, will not eject or accept CD's. Before repair, disconnect one of the car battery terminals for several minutes. This acts as a reset and may bring the changer back to working conditions. Otherwise, repair rate $295. CQ-JS8360X / 86120-AA140 CD does not operate properly, error or distortion when CD plays, (single disc player), no AM, intermittent audio and display, $185. Audio drops out, comes back and drops out again? Your local dealership is very proud of this audio system and may quote $1200 to $1600 for a stereo replacement. This is a Courtesy Lamp Switch problem, engaged when the convertible roof goes up and down. The dealership may claim there is no such switch, part number 84231-06010. Location of switch - passenger's side rear seat, behind panel and convertible roof motor. A56831 / CQ-ES8360X / 86120-AA120 CD changer jammed, will not play CD's, will not accept or eject CD's, repair rate $295. Also, stereo locks up with no functions working until car is turned off and back on. This stereo communicates with the amplifier. We have not determined what component in the system is causing this problem at this time. A56840 / CQ-ES8460X / 86120-AA180 Six CD changer, Err message in display, will not play CD's, will not eject or accept CD's. Before repair, disconnect one of the car battery terminals for several minutes. This acts as a reset and may bring the changer back to working conditions. Otherwise, repair rate $295. Single CD player, will not play CD, $195. Single disc player, CD does not operate properly, error or distortion when CD plays, cassette clicks or speeds up intermittently, $185. Six CD Changer, grinding, will not accept or eject CD, CD error, $295. A56817 / CQ-ES8060Z / 86120-08130 Six CD changer, Err message in display, will not play CD's, will not eject or accept CD's. Before repair, disconnect one of the car battery terminals for several minutes. This acts as a reset and may bring the changer back to working conditions. Otherwise, repair rate, $295. CD does not operate properly, error or distortion when CD plays, single disc player, cassette clicks or speeds up intermittently, $195. 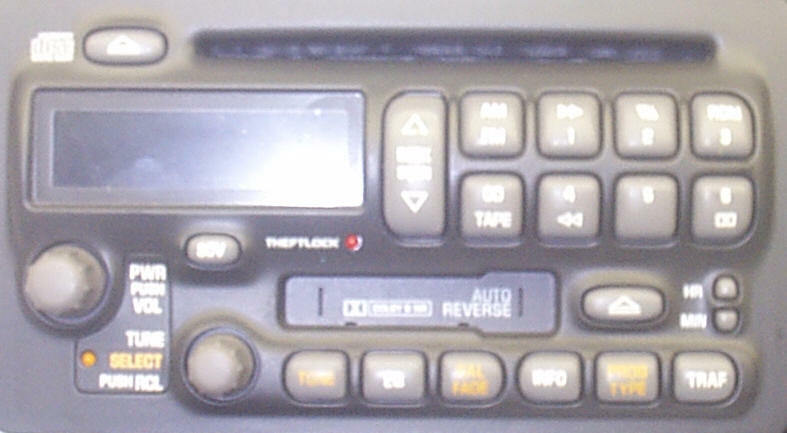 56807 / 86120-33040 / CQ-JS8410A CD does not operate properly, error or skips when CD plays, single disc player, $195. Power Antenna Mast Power Antenna Removal and Mast Replacement. Safety Recall Low or no audio. Call the dealership, there is a campaign for most of these stereos, have your vehicle ID# ready for when they ask. 122000-22600101 Six CD changer, Err message in display, will not play CD's, will not eject or accept CD's. Before repair, disconnect one of the car battery terminals for several minutes. This acts as a reset and may bring the changer back to working conditions. Otherwise, repair rate $295. Single CD player, skips, does not play CD, $195. Celica Hatchback '90-93 Power Antenna Removal and Mast Replacement. A51813 / CQ-JS7460X / 86120-02430 Single CD player, will not play CD, $195. No audio output or intermittent, no or intermittent tape, display back lights intermittent, tape clicks one direction or both. Defective stereo $125. 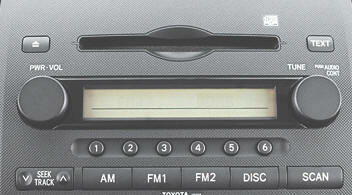 CD does not operate properly, error or distortion when CD plays, single disc player, $185. Car radio works, no or intermittent audio? See DIY. CD inop with error code, will not eject or play CD, $185. 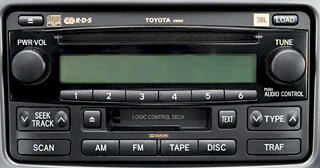 122000-93200101 / 86120-35400 CD does not operate properly, error or distortion when CD plays, single disc player, $185. Navigation - stereo will not turn on or load past navigation screen, powers on and off, defective nav CD drive, Nav drive clicks when attempting to eject or load, $295. Four CD Changer jammed, will not accept or eject CD's, $295-345. Navigation and 4 CD changer problems $550-600. 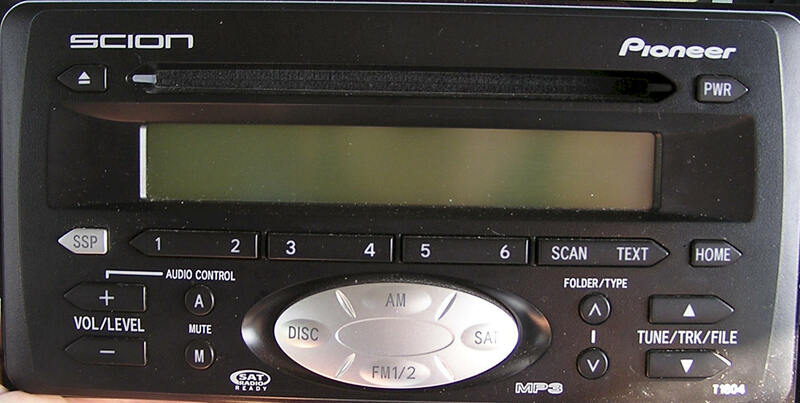 Single CD player, Err message in display, "Reading CD" will not play CD's, will not eject or accept CD's, $175. A56833 / CQ-ET8360X / 86120-48480 Six CD changer, Err message in display, will not play CD's, will not eject or accept CD's. Before repair, disconnect one of the car battery terminals for several minutes. This acts as a reset and may bring the changer back to working conditions. Otherwise, repair rate $295. 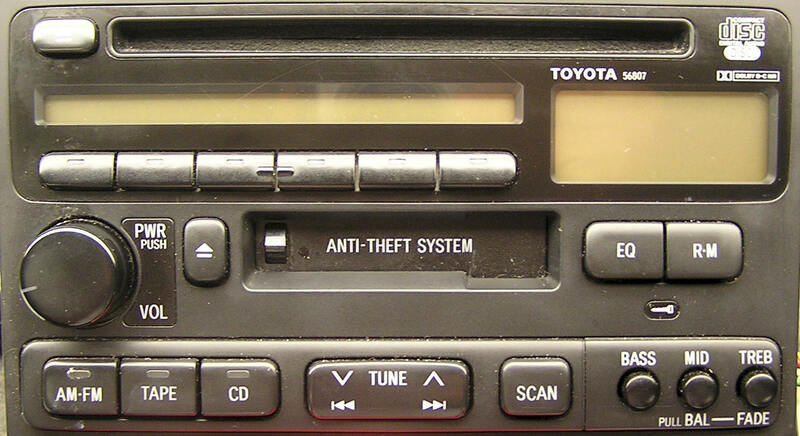 A56832 / 86120-48430 / CQ-ET8361X Six CD changer, Err message in display, will not play CD's, will not eject or accept CD's. Before repair, disconnect one of the car battery terminals for several minutes. This acts as a reset and may bring the changer back to working condition. Otherwise, repair rate $295. Single CD does not operate properly, error or distortion when CD plays, single disc player, cassette clicks or speeds up intermittently, $195. No power, check both fuses first, repair $150. Six CD changer, Err message in display, will not play CD's, will not eject or accept CD's. Before repair, disconnect one of the car battery terminals for several minutes. This acts as a reset and may bring the changer back to working condition. Otherwise, repair rate $295. A56823 / CQ-JT1011X / 86120-AD040 CD does not operate properly, error or distortion when CD plays, single disc player, cassette clicks or speeds up intermittently, $195. CD does not operate properly, error or skips when CD plays, single disc player, $195. 11820 / 123000-0120c101 Six CD changer, Err message in display, will not play CD's, will not eject or accept CD's. Before repair, disconnect one of the car battery terminals for several minutes. This acts as a reset and may bring the changer back to working conditions. Lack of technical support and parts, presently we do not repair this stereo. 12220939 No or dim display, $85. Warranty on display repair, one year. CQ-JS3110A / 86120-17340 / 56805 CD does not operate properly, error or skips when CD plays, erratic audio, cassette ejects, parts discontinued for repair. We no longer repair this car stereo. 56838 / CQ-ES0360A / 86120-47100 (JBL Audio) Six CD changer, Err message in display, will not play CD's, will not eject or accept CD's. Before repair, disconnect one of the car battery terminals for several minutes. This acts as a reset and may bring the changer back to working conditions. Otherwise, repair rate $295. Six CD changer, Err message in display, will not play CD's, will not eject or accept CD's. Before repair, disconnect one of the car battery terminals for several minutes. This acts as a reset and may bring the changer back to working conditions. Otherwise, repair rate, $345. Single CD player, will not accept, eject or play CD's, $190. A51856 / CQ-ET1760X / 86120-0C260 Six CD changer, Err message in display, will not play CD's, will not eject or accept CD's. Before repair, disconnect one of the car battery terminals for several minutes. This acts as a reset and may bring the changer back to working conditions. Otherwise, repair rate $295. Six CD changer, Err message in display, will not play CD's, will not eject or accept CD's. Before repair, disconnect one of the car battery terminals for several minutes. This acts as a reset and may bring the changer back to working conditions. Otherwise, repair rate $295-345. E7013 / 86120-0C220 / DW468100-0318 Will not play Navigation CD - Check Navigation CD first. Navigation CD clicks when loading or ejecting CD, $375. A56835 / CQ-ET1362X / 86120-0C121 Six CD changer, Err message in display, will not play CD's, will not eject or accept CD's. Before repair, disconnect one of the car battery terminals for several minutes. This acts as a reset and may bring the changer back to working conditions. Otherwise, repair rate $295. Six CD changer, Err message in display, will not play CD's, will not eject or accept CD's. Before repair, disconnect one of the car battery terminals for several minutes. This acts as a reset and may bring the changer back to working conditions. Otherwise, repair rate, $295. 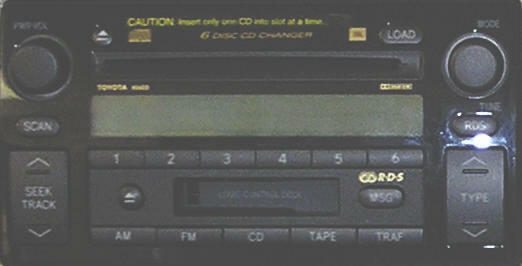 Single CD player does not operate properly, error or distortion when CD plays, cassette clicks or speeds up intermittently, $195. CD does not operate properly, error or distortion when CD plays, (single disc player), no AM, intermittent audio and display, $195. 4 CD Changer or Nav drive error, or not working, $350. Stereo will not move past this screen? Insert correct Nav CD and/or clean Nav CD. Otherwise, Nav drive is defective and needs repair. 08-10 Toyota Sienna Speakers cut in and out - Rear Entertainment defective. A56823 / CQ-JT1011X / 86120-AD040 CD does not operate properly, error or distortion when CD plays, (single disc player), no AM, intermittent audio and display, $195. 04-08 Toyota Solara Convertible - ONLY Audio drops out, comes back and drops out again? Your local dealership is very proud of this audio system and may quote $1200 to $1600 for a stereo replacement. This is a Courtesy Lamp Switch problem, engaged when the convertible roof goes up and down. The dealership may claim there is no such switch, part number 84231-06010. Location of switch - passenger's side rear seat, behind panel and convertible roof motor. UM-259TL1 / 86280-14290 No power, no or low audio output, $400. 6 CD Changer, will not eject, accept or play CD's, $295. A1808 / 28222285 / 28120-04171-A Single CD player, will not accept, eject or play CD's, $190. 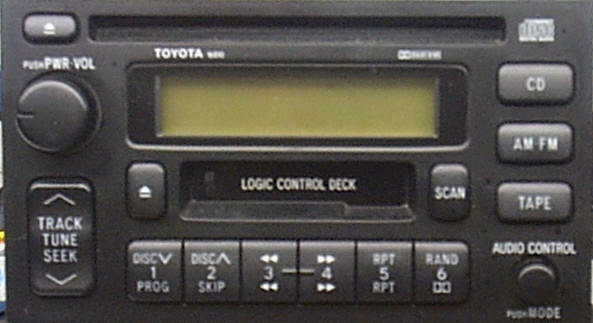 CD does not operate properly, error or distortion when CD plays, single disc player, cassette clicks or speeds up intermittently, $185. 57070 / CV-VT13E1*X / 86140-0C040 Cracked or broken display, $350. 16955 / 122000-45710101 / 86120-0C081 Single CD player, will not accept, eject or play CD's, rubbing sound when playing CD, $195. A56830 / CQ-ET1360X / 86120-0C140 Six CD changer, Err message in display, will not play CD's, will not eject or accept CD's. Before repair, disconnect one of the car battery terminals for several minutes. This acts as a reset and may bring the changer back to working conditions. Otherwise, repair rate $295. A56823 / CQ-JT1011X / 86120-AD040 CD does not operate properly, error or distortion when CD plays, single disc player, cassette clicks or speeds up intermittently, $185. P1803 /DEX-MG8157zt / 86120-35340 Six CD changer, Err message in display, will not play CD's, will not eject or accept CD's. Before repair, disconnect one of the car battery terminals for several minutes. This acts as a reset and may bring the changer back to working conditions. Otherwise, repair rate $295-345. 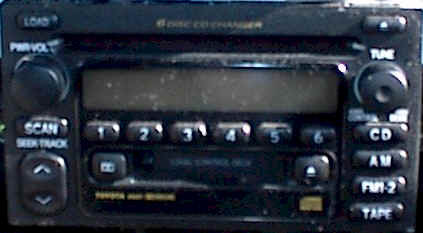 56836 / CQ-ET1260AA / 86120-35201 Six CD changer, Err message in display, will not play CD's, will not eject or accept CD's. Before repair, disconnect one of the car battery terminals for several minutes. This acts as a reset and may bring the changer back to working conditions. Otherwise, repair rate $295. a6852 / 86120-35281 / 122000-6710101 Single CD player, will not accept, eject or play CD's, $225. 16862 / 122000-4601A101 / 86120AE011 CD does not operate properly, error or distortion when CD plays, (single disc player), no AM, intermittent audio and display, $225. AD6803 / 09357129 CD does not operate properly, error or distortion when CD plays, single disc player, CD error, $185. Loose volume control, no on/off power, tape does not operate properly, poor audio on tape, no display, no output, $165-185. 16836 / 122000-4570A101 / 86120-0C080 We no longer repair this CD player, CD's will not play. Poor audio quality on one or all channels. Parts are no longer available, we no longer repair this CD player. CD does not operate properly, will not eject, grinds, displays Err. This is a CD changer we no longer repair. This is a very problematic CD changer and seen too many times back in shop for warranty repair for other than the original problem. Amplifier snaps, crackles, pops or no audio. There may be water damage to this car stereo amplifier. (Model #'s from face - 34210, 34212) Unit will not accept a disc, or will not eject. This unit has an Eject Override feature. Lightly press and hold the eject button for 5 seconds. This may reset the stereo. (Model # from face T9200, CDS-8026) CD has error. Avalon XLS Will not load or eject cartridge, or has error code. We no longer repair this Alpine 3 CD changer. CQ-JS8110A / 86120-331000 AM/FM/CASS/CD/COMBO. Distorted or low volume on one or more functions. These sound systems have two separate units, the stereo unit in dash and an amplifier located under dash or under seat on passenger side. 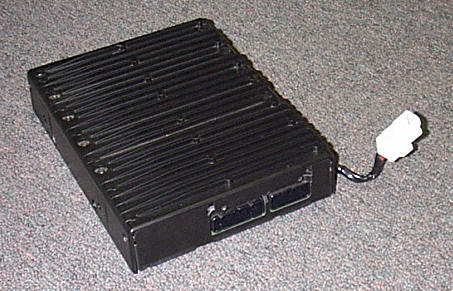 There are two different style amplifiers, (one shown below). One or usually both units have a defect. One style amp is reasonably replaced by the dealership while the others are not. Calling your local dealership about an exchange unit. Parts are no longer available, we do not repair this CD changer.